Dutch designer Floris Wubben crafts beautifully strange pieces that combine natural and high-tech materials. It’s that blend of rough, textured surfaces with new technologies that makes his designs stand out from the crowd. One of our favorite examples is the No. 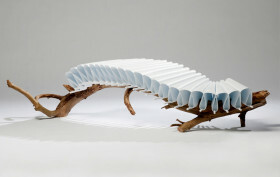 3 Bench, made from an accordion-folded sheet of white polypropylene that follows the contours of a piece of driftwood.